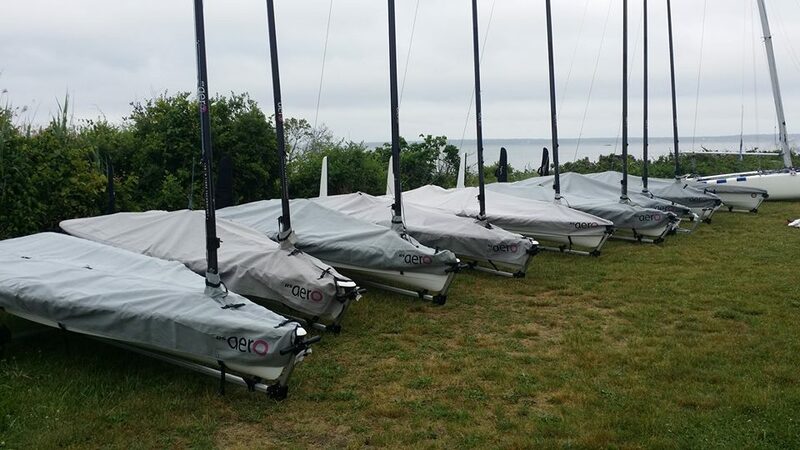 12 hardy souls braved windy conditions for the premier leg of the RS Aero US National Tour! Saturday dawned light and hazy, making the assembled sailors dubious about the forecasted winds. After some rain cells passed through, the RC sent us out in very light southerly breeze that built to a pleasant 8-10 knots by the first start. Two races were sailed in increasingly strong breeze, maybe topping out at 15-17. It was impressive seeing how well lighter sailors in the 7s did against the big boys in 9s, with boats finishing surprisingly close. Apres racing, Wickford YC hosted a wine bar, free beer and a delicious dinner complete with homemade ice cream sandwiches (your scribe was noted to go back for 4ths on the latter). At dinner, regatta organizer Skip Whyte warned of even bigger breeze for Sunday afternoon. In an effort to spare us, the RC set a first-start time of 10am, but Mother Nature was already pumping a gusty Nor'wester down the bay by 9:30. Some sailors, remembering the forecast for 40 knots gusts, opted to either stay ashore or sailed in early. Others stepped down to smaller rigs, including Texan Jamie Gillman and Lissa Solnick in 5s. Lissa gets the Iron-Person award for perseverance, overcoming a tiller extension malfunction and tons of capsizes but still getting ashore unassisted in nearly 30 knots of breeze. Two races were eventually sailed once the RC got their anchors to hold. 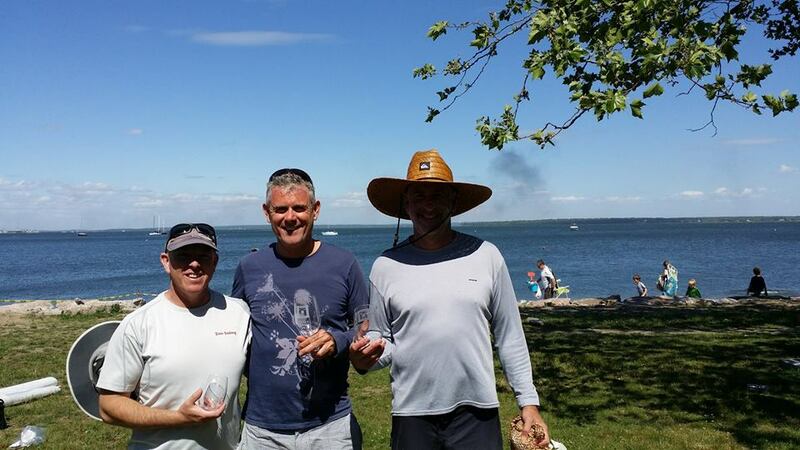 Jamie, at 130 lbs soaking wet, was wicked fast in the 5, giving Tim Desmond (200+ in a 9) and Bob Adam (170 in a 7) a run for their money upwind and down in Sunday's first race. By the second race only four boats remained, with Tim Desmond hanging tough with your scribe until the latter got the boat planing upwind on a favorable shift for the lead at the first mark that wasn't relinquished for the remainder of the race. Many thanks to everyone who participated in the event and helped unload/load the boats. Special thanks to Doug DuBois for flying out from UTAH to participate, and Jamie Gillman who DROVE from Texas. 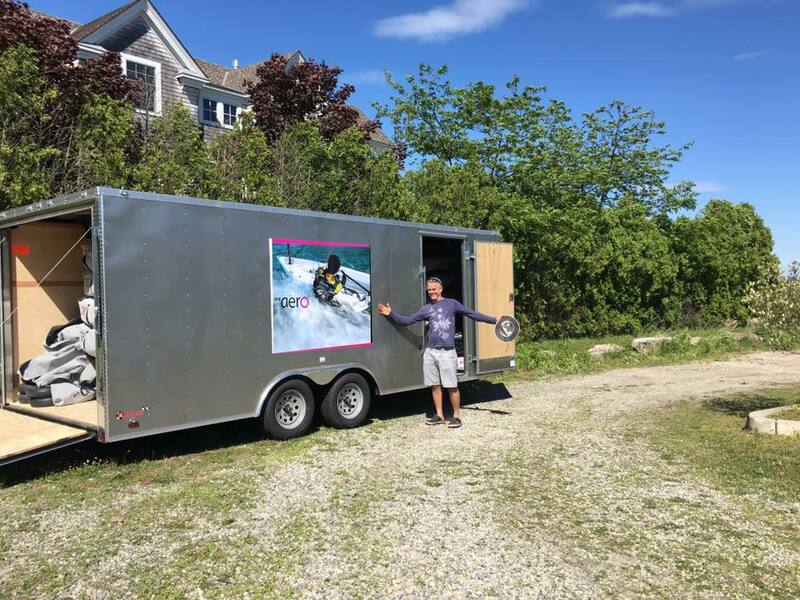 Next stop: Massapoag Regatta, Boston this coming Saturday, June 18. 16 entries so far!